What is a Delaware Sublease Agreement? Delaware Sublease Agreement: What Is It? 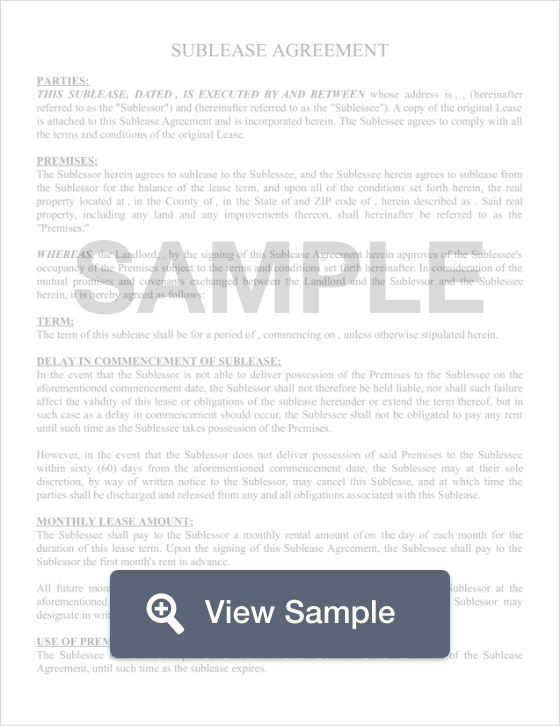 In Delaware, sublease agreement is a legal contract between a sublessor and a sublessee. A sublease agreement occurs when a person who originally signed a lease to an apartment (a sublessor), in turn, leases the rental to someone else (a sublessee). This type of situation is common and occurs when a tenant signs a long-term lease, but experiences a change that the rental cannot accommodate. For example, if someone is locked into a year-long lease, and four months into their lease, their job requires them to relocate, or if they have a situation that requires them to leave town for a period of months, they may look into a subleasing their apartment. Another situation where a person may want to sublease their apartment is if they signed a year-long lease and have purchased a home. Rather than breaking the lease, which can be quite costly, some prefer to sublet the apartment to another renter. When entering a sublease agreement, it is very important that the sublessor understands that even though the sublessee will be living in the unit and paying rent, that it is the original tenant who will be held responsible should any damage or late rent payments occur. Delaware Tenant/Landlord law specifies that unless it is blatantly written in a lease that the tenant may not sublet the unit, the tenant may sublease the apartment or property. However, a lease agreement may also reasonably deny, or restrict a tenants ability to sublease an apartment. Some agreements impose the stipulation that the sublessor must receive written permission from the landlord.